What is “thread runout” and what specifications cover it? 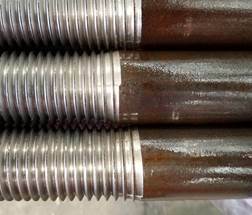 The thread runout portion of a bolt is where the threaded section transitions into the bolt shank. This area exists beyond where the usable thread stops. In other words, if you were to assemble a nut all the way onto a bolt, the nut will stop, but there will still be a small portion of thread which is unusable as it transitions into the smooth body shank of the bolt. For more specific information in regards to the description of externally threaded fasteners, refer to ASME B1.1 or Inch Fastener Standards from IFI (Screw Threads, 2003, Section A). As far as a maximum length of thread runout allowed, it is specifically defined for hex cap screws and heavy hex structural bolts, but not for a standard hex bolt. As stated in the ANSI/ASME B18.2.1 specification for hex cap screws and B18.2.6 for heavy hex structural bolts, there is a “Transition Thread Length (Y)” for a given diameter of bolt. Below is a chart showing the maximum length of thread runout allowed.